I am lucky to be part of a great circle of friends, wonderful, talented creative ladies every one of them. These women are the people I refer to when I tell my Mechanic Man “I’m seeing the girls.” They’re the ones I ask for advice and give advice to, the ones who have helped me out, the ones I help out, and the ones whose company I seek when I am seeking company. 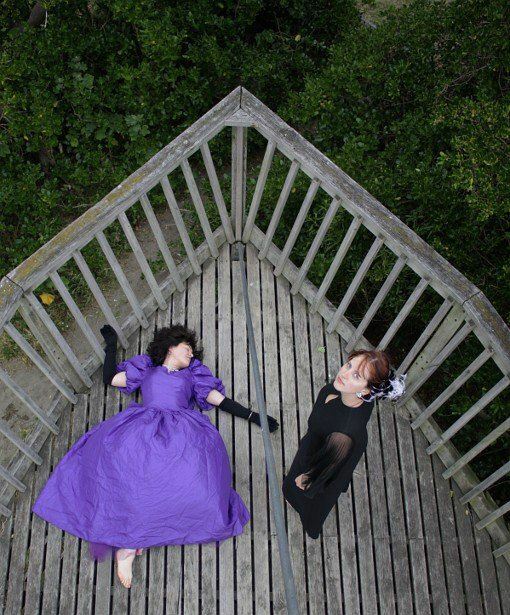 We’ve done photo shoots together, picnicked together, taken part in historical costuming events together, road tripped together, and played Sing Star together. I adore each and every one of them and wouldn’t be without them. And as I’ve already mentioned them more than once, and am likely to mention them again, I wanted to devote a bit of space to telling you how I was blessed by them. MrsC was a gift to me by my old employer. Truly! I was part of a team of three reporting into the wonderful Pennie. At the beginning of 2008 BOTH of my colleagues resigned, just over a month apart, and I spent the next three months singlehandedly performing our function and desperately waiting for back-up. Pennie started recruiting for two new people, one of whom would manage me and the other recruit. But as I was the only person left, Pennie was determined that both the new hires would be people I’d get on well with. MrsC was one of the final two candidates for the manager role. The other candidate was a little more qualified (which I find hard to believe because how could anyone be better than MrsC at anything!) but Pennie knew that Mrs C was into that “weird sewing stuff” that I did and figured that our personalities would match so the deal was struck. And she was right. Oh so very very right. Lithium and oxygen explosively right. We hit it off instantly. We’d start every day at the office with a catch-up about our sewing and crafting, our lives, our men, our hopes and dreams and frustrations. Occasionally we talked about work, if it didn’t interfere. Our friendship extended waaay past a normal boss-worker one. MrsC always encouraged me in everything (if by encourage you mean threatening to make my work-place performance review hinge on my sewing performance). She encouraged me to seek out burlesque classes and supported my enthusiasm. (I’m possibly the only office worker to have been bought underwear by her boss not once but THREE times.) 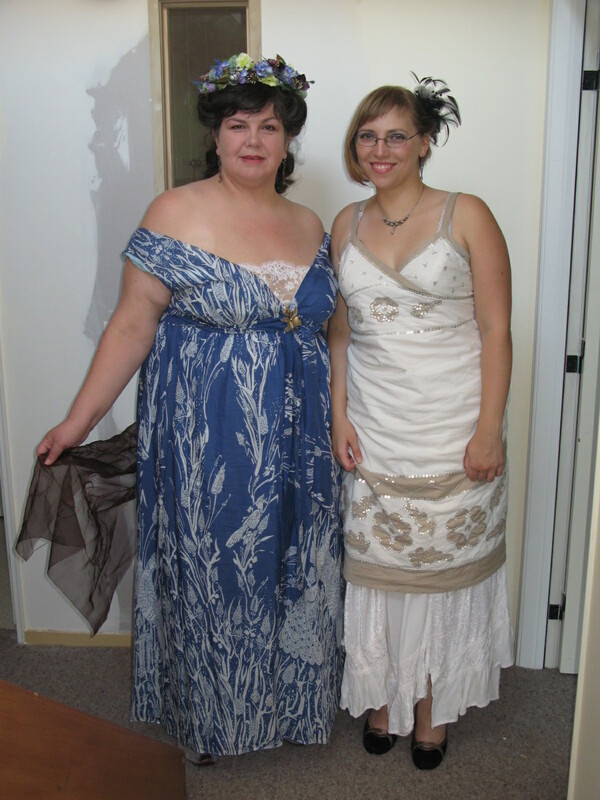 She has rescued me from sewing woes and kindly made me not one but two dresses when needed for specific occasions and I wasn’t able to do it! She famously left her job as my manager to open Made on Marion, Wellington’s best craft supplies store. It shows how alike we are that this is also a dream of mine; one I first planned over ten years ago. I’ll get there one day! MrsC is one of my dearest friends. My mum refers to Mrs C as my Wellington mum, and there’s something in that! She’s creative and talented and passionate. I couldn’t imagine my life without her dry humour, her endless capacity to listen and talk, and well, her just all-round freaking awesomeness. At the end of 2009, just over a year after I met MrsC, I had the idea to invite her and a couple of other crafters over to take advantage of my newly set-up giant craft room. Mr C thought it was a great idea and the unimaginatively named monthly craft day was born and has been going ever since. Mrs C and I ready for the Art Nouveaux ball, organised by The Dreamstress of course. MrsC made her dress. Photo courtesy MrC. 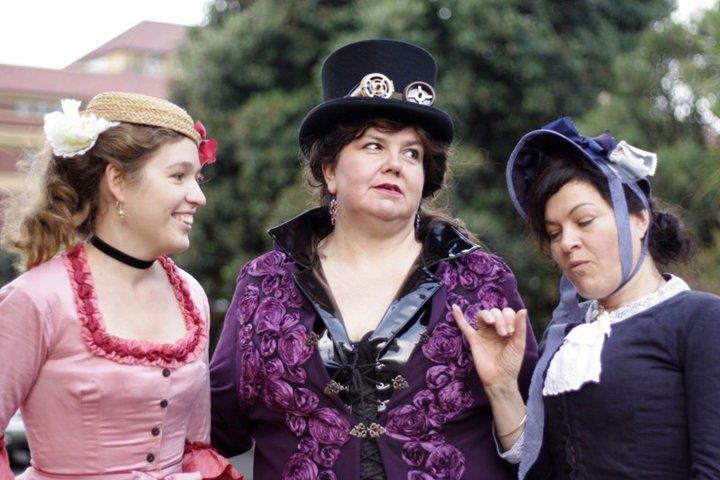 The Dreamstress, MrsC, and Madame Ornata playing dress-ups. 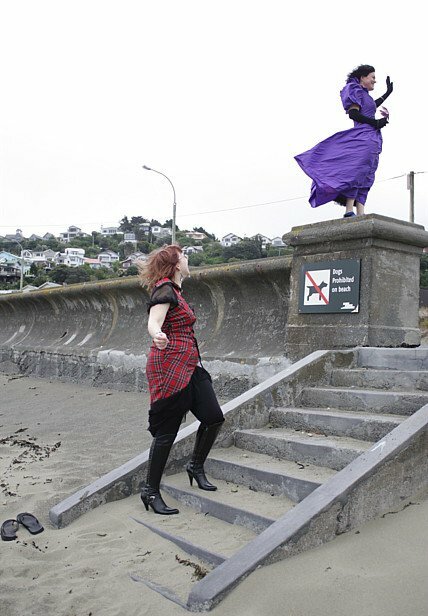 MrsC made her purple coat and The Dreamstress made both the other outfits. Photo courtesy Sarah. 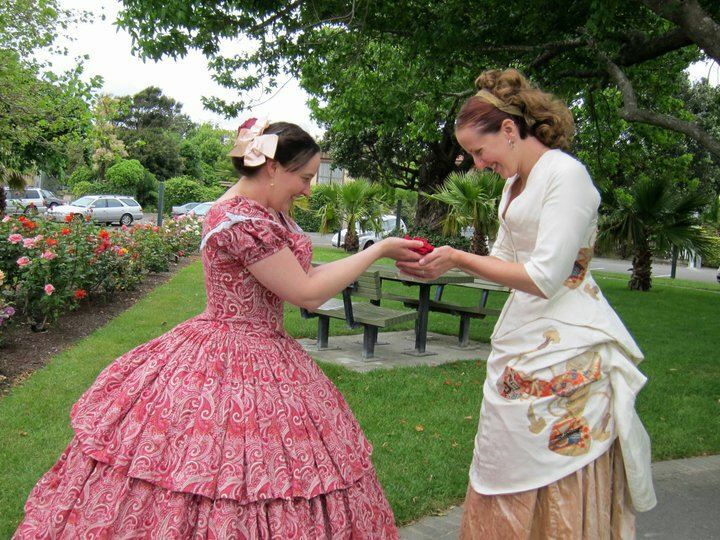 MrsC, unlike me, has an interest in truly historical costuming. (My fashion interests don’t really start until the 1930s). 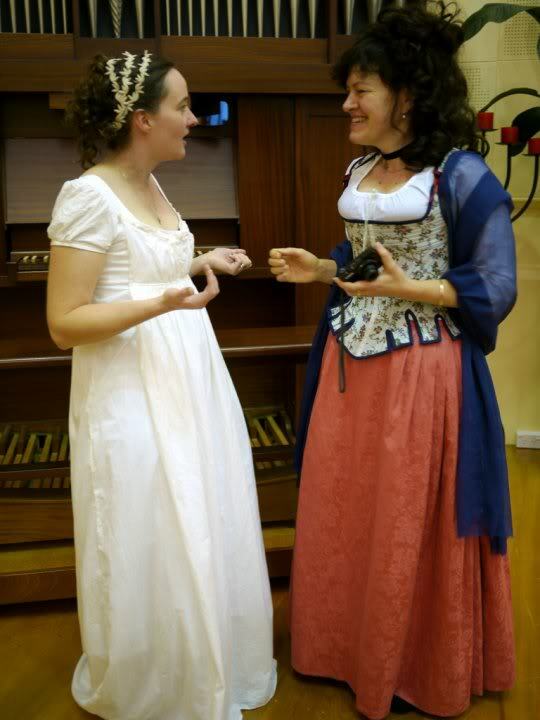 In 2009 there was a ball and show called The Affair of the Diamond Necklace and attendees were required to dress in era-appropriate clothing and attend an interactive dinner set in the Court of Versailles. 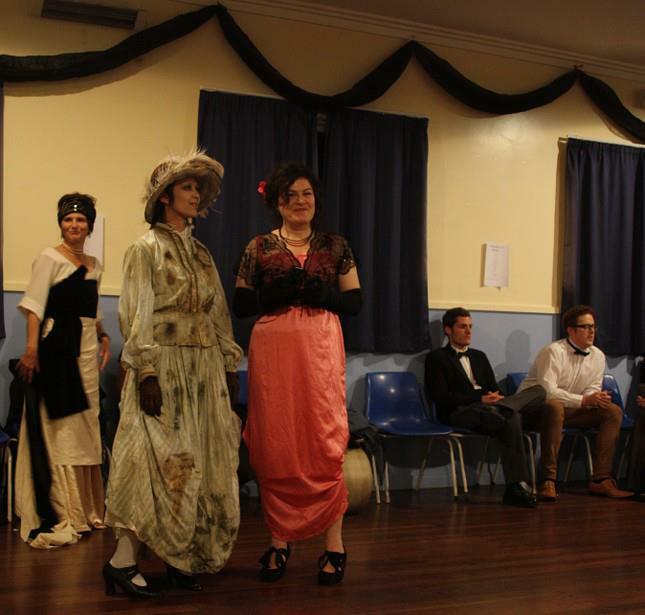 Upon Googling this, MrsC discovered The Dreamstress, who was making up a very fancy dress to wear to it. Being the social butterfly she is, Mrs C contacted The Dreamstress and they struck up a fast friendship. When I had my inaugural monthly craft day, Mrs C asked if she could invite The Dreamstress. The more the merrier I said! And so The Dreamstress entered my life when she turned up at my house that first month and has been a treasured friend ever since. I doubt there’d be as many days of dress-ups and photo shoots if not for The Dreamstress. The Dreamstress is without doubt one of the most amazing seamstresses I know and I’m always amazed at her skill and talent. I consider myself lucky to get to handle and sometimes even wear her work and one of my goals is to be able to afford a custom corset, or three. And The Dreamstress is of course a wonderful person to know. Witty, kind, and generous, full of wry observations and always up for an adventure, she is fun to be around. 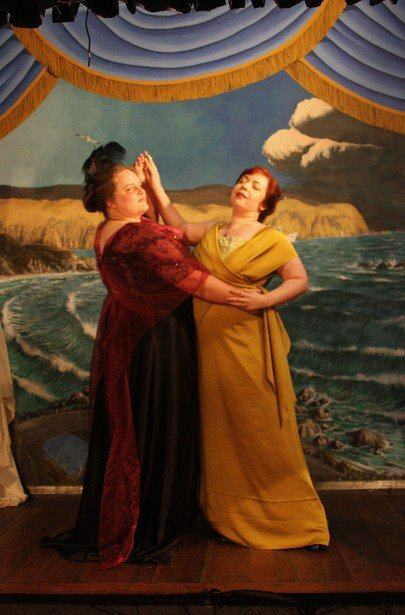 The Dreamstress, Madame O and Shell, at a photo shoot. 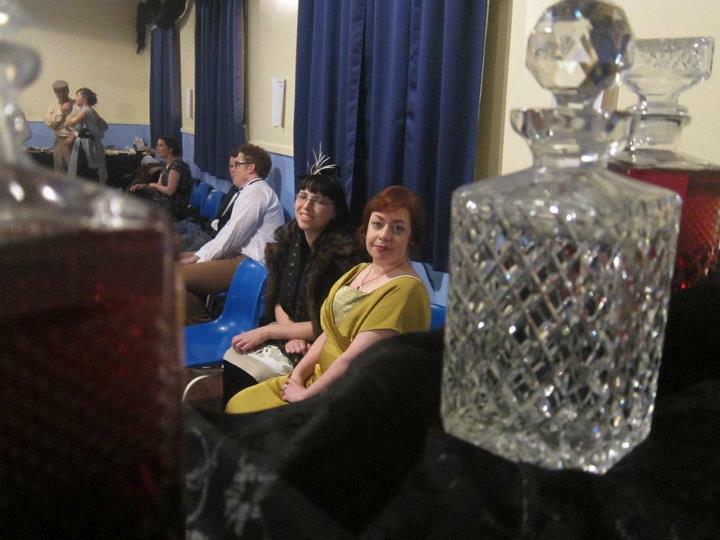 Shell was there to do styling and both The Dreamstress and Madame O are wearing things they’ve made. Photo courtesy Sarah. The Dreamstress playing dress-ups with Madame O, and Shell helping to style. Photo courtesy Sarah. The story of how I met Madame O is short and sweet. 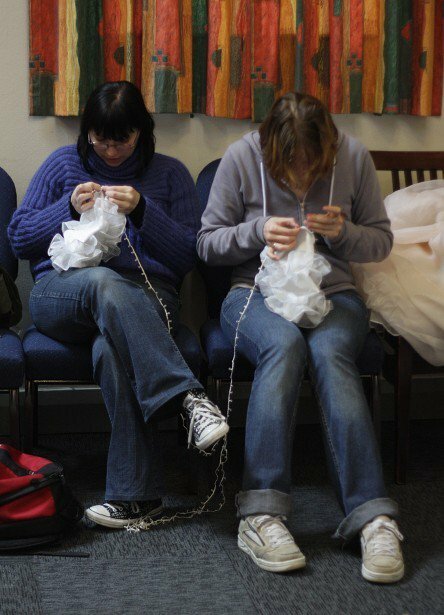 When Mrs C extended the initial invitation to craft day to The Dreamstress, she in turn emailed me asking if she could bring a friend. So Madame Ornata arrived with the The Dreamstress and I loved her on the spot. Another talented and incredible woman, she does the most exquisite embroidery that will make you whimper with delight, makes amazing historical gowns, and crafts beautiful, delicate jewellery. She’s also a well educated and talented scientist. She shows up regularly in The Dreamstress’ blog modelling garments. She also has the most enthusiastic, outgoing, buoyant approach to life. Being with her is like being with a box-load of puppies, all wriggly unconstrained enthusiasm that makes you want to laugh and enjoy life just by being in her presence. She’s damn funny to boot and an absolute ham when on camera – oh I wish I could show you some of the photos we have of her – but some are too outrageous for the public! What a glorious woman to be friends with. 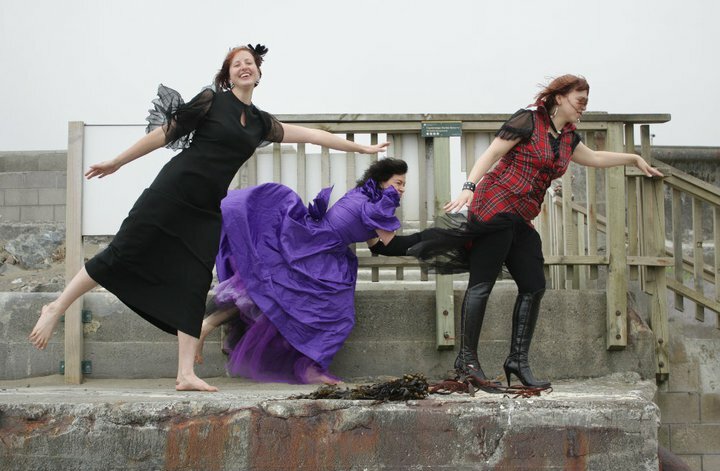 Me and Madame Ornata playing stupid dress-ups at the beach, along with Shell and Sarah. Photo courtesy Sarah. I don’t even know what we were doing. I think this was under the instruction to “emphasise the wind”. Madame O got it right. Photo courtesy Sarah. About the same time I started craft day, Mrs C and I decided to throw a craft market at work for Christmas. A colleague of ours, LM introduced us to another friend, who we told all about our market. She in turn introduced us to a friend of hers who makes amazing things, so that she could put her wares in our market. Simply selling her stuff wasn’t enough, we wanted her as one of ours, so “Come to craft day!” I chirped! So The Sewphist came, she met The Dreamstress and Madame Ornata, and another link in our group was permanently installed. The Sewphist is multi-talented, not only making incredible giftwares for sale but running Made.It, a great hand made goods shop in town! (Seriously, it’s an amazing store, she curates the most incredible range or handmade pieces.) She also speaks French fluently and has an amazing choral voice. She’s also kind, funny and thoughtful, and is the dear friend who cut out and made up my flame skirt while I tidied up her fabric stash. Yet another special woman I am lucky to be friends with. The Sewphist, me, and Shell lounging at The Sewphist’s birthday party at hers. Photo courtesy Sarah. The Sewphist being adorable along with Shell, both in The Dreamstress creations. Photo courtesy Madame O. 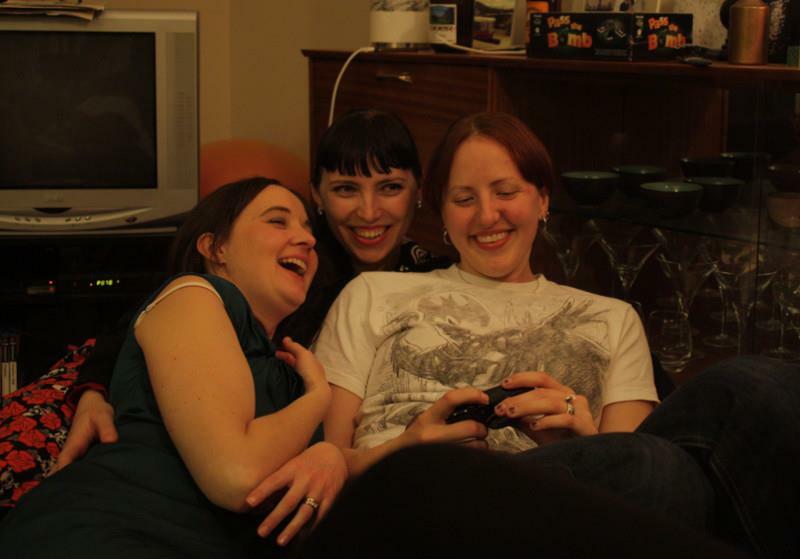 In June 2010 the above trio of ladies were well established as dear friends. Mrs C and I were flogging off unwanted fabric (yes, it does exist!) at Fabric-a-brac the morning of one of The Dreamstress’ historical shows. A lovely lady picked up a piece of my fabric and was eyeing it up. I asked her what her plans were for it and she said a historical skirt. Spotting an opportunity, I thrust a pamphlet for the afternoon’s show into her hands. She then bought the fabric as well as a sari from MrsC’s stash to line a coat. That afternoon she showed up at the show, wearing a gorgeous coat she’d made. I introduced her to MrsC as the person who’d bought the sari that morning and she opened the coat to reveal it was self-made and the lining was another sari. MrsC laughed – she’d sold THAT sari to Sarah at the previous FAB! “Come crafting next week” said I, and she did, and another firm friendship was made, with me and with the others above. Sarah is a fearless creator, setting her mind on something then figuring out how to do it. She has the brains of a rocket scientist (seriously! She has a Masters in astronomy) and the creativity of an artist. She has a fabulously dry wit and is great fun to hang out with. She is also the photographer of our group, talented and creative, and the mastermind behind my flame dress fancy shoot as well as the credit of most of the photos here. If there is a dress-up to be had, she’ll be holding a camera. 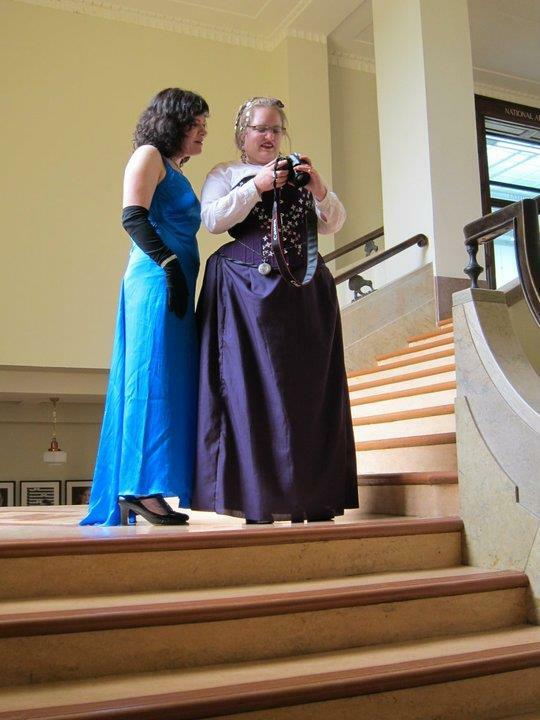 Sarah and Emily being beautiful Edwardian women at The Dreamstress’ Ghosts of the Titanic historical costume ball. Sarah made her gown and Emily models a Dreamstress creation. Photo courtesy Madame Ornata. Shell is an American who met The Sewphist online in a craft-related forum. In November 2010 she came to New Zealand for a working holiday. The Sewphist brought her to Sarah’s birthday party pretty much straight from the airport when she arrived, and was instantly adopted by our entire group.She met her now-husband on her second day in the country too, so she didn’t do too badly in two days! I was lucky enough to have Shell flat with us for about 6 months of her stay, and she was great fun to live with. 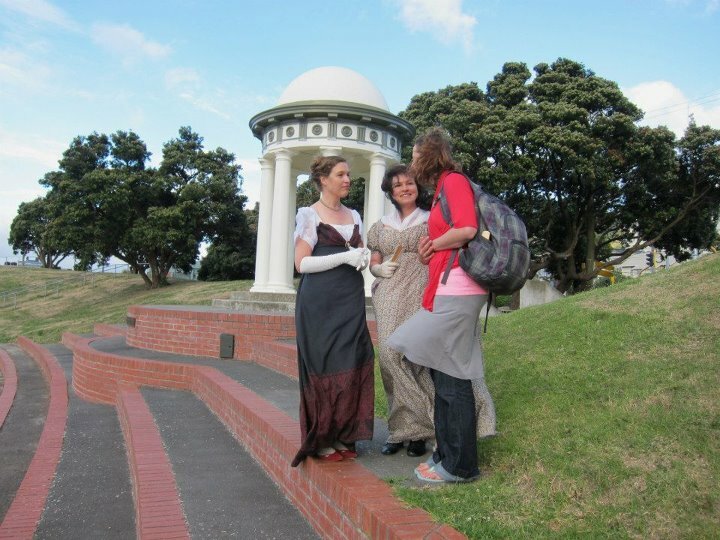 Our whole group was heart broken when she had to leave New Zealand at the end of her visa, taking her new husband with her, and delighted when the two of them secured a new visa so she could return. 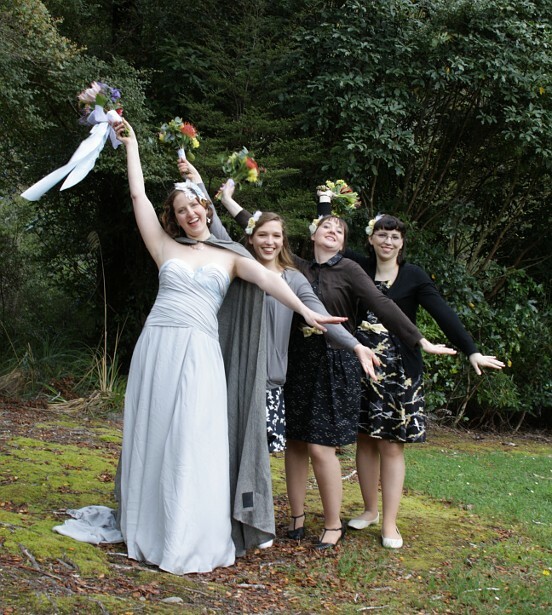 Her NZ wedding was a real family affair, organised in 6 weeks, with MrsC acting as Mother of the Bride; The Dreamstress as dressmaker; The Dreamstress , The Sewphist and me as bridesmaids; Madame Ornata as florist and table decorator; and Sarah as official photographer; and it is of course thoroughly blogged on The Dreamstress’ blog. Shell is sweet, funny, creative, and basically damn good fun to hang around with. She has a clever and witty humour and is easy to talk to about anything. And she’s tolerant of us teasing her about her accent and an amazing potter. 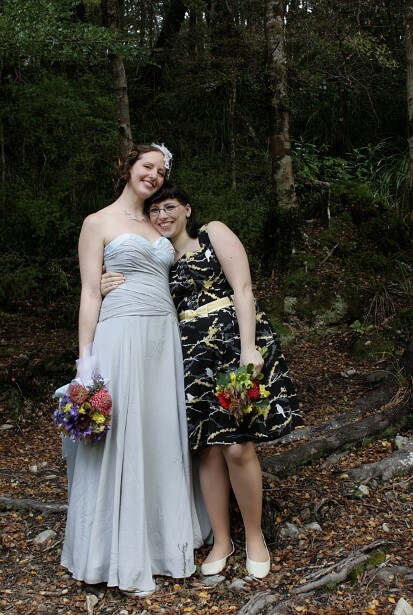 It was a real privilege to be part of her wedding and I’m so pleased to be her friend. 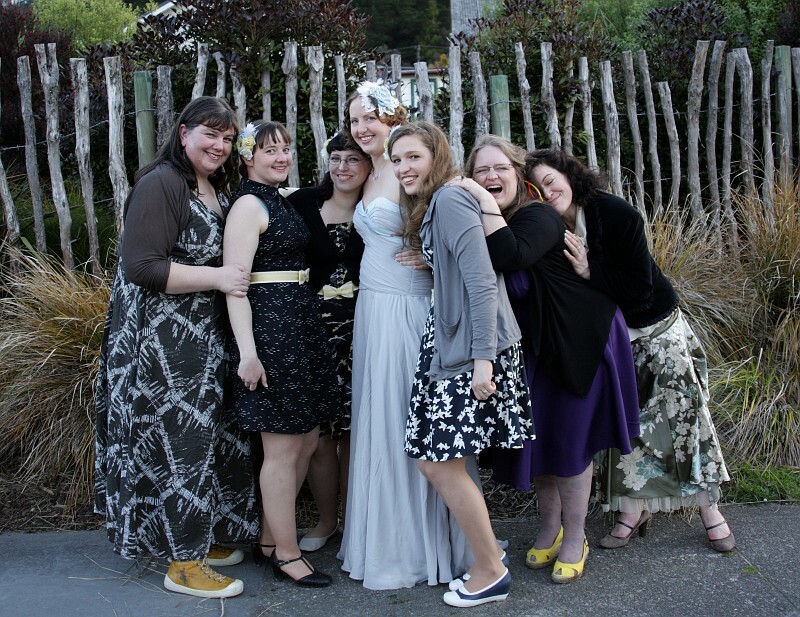 I was lucky to be one of Shell’s bridesmaids, along with The Sewphist and The Dreamstress. The Dreamstress made Shell’s dress and MrsC made mine. Photo courtesy Sarah. Shell does spooky well. Madame O does hilarious well. This is what happens when they occur at the same time. Photo courtesy Sarah. 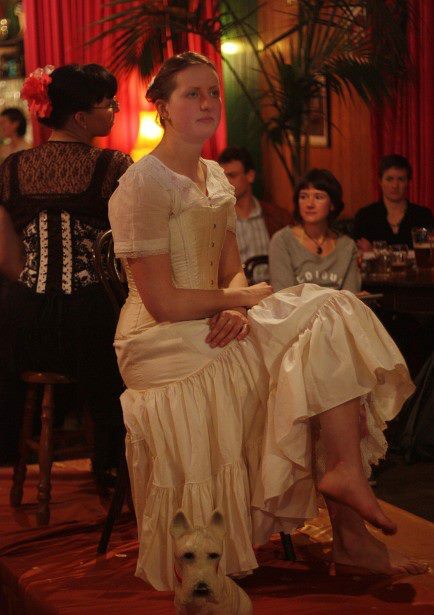 I met Nini through sewing classes that I attended way back in 2007, and thought she was lovely. When I started craft day in 2009, I asked her to come along and we started to get to know each other better, and I’m so glad we did. Through craft day she eventually met everyone else in the crew too! Nini replaced sewing with jewellery making as her creative outlet, and quickly settled on a steampunk, Victorian, gothic aesthetic. 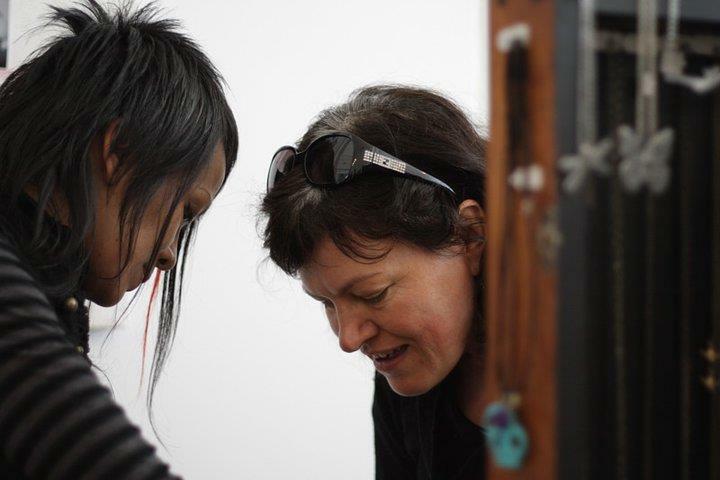 Her work is simply beautiful.Every one of us has some of her beautiful jewellery and although her kids mean she doesn’t get to hang out as often as we’d like, I always enjoy her company when I get it. She is a free spirit, exuberantly generous, creative and kind, with a wonderfully refreshing viewpoint on the world that make conversations with her fascinating. I met Emily through MrsC. MrsC had earmarked us to meet as she thought we’d get along. 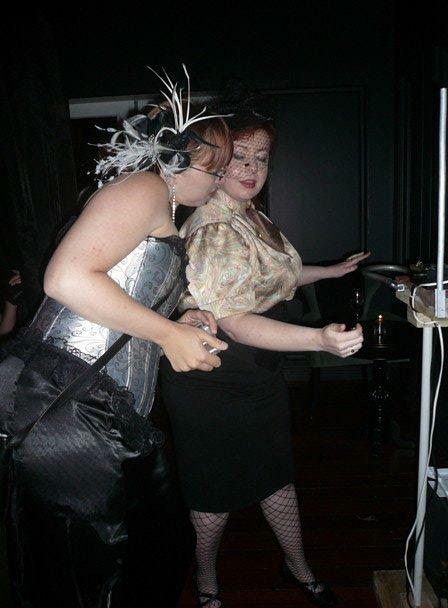 One day in 2010 MrsC realised Emily and I were both going to the same burlesque event and thought “Aha! You can now meet!” Equipped with MrsC’s info, and a memory of a LinkedIn photo, I traipsed up to a beautiful redhead during the intermission and asked “are you Emily?” And she was.And we talked and got along but didn’t really get a chance to arrange to catch up again. It turned out she also knew The Dreamstress, and shortly we met again at one of The Dreamstress’ afternoon teas. I invited her along to craft day, and, as per usual, she met and bonded with the group. Emily has a sharp mind, and is wonderful to talk with. She has a great dry wit, a fabulously entertaining and insightful blog, and a sharp fashion sense. She’s also the only one in this group who shares my love of burlesque and modern pin-up and leopard print so we see each other through that social circle too. She’s a talented MC and always fantastic to watch on stage, working her magic on the crowd. Again, what a delight to have her in my life. Emily and The Sewphist stop by to visit MrsC and her shop before it opens. Photo courtesy Sarah. These women are all without fail incredible people. They’re all so diverse, but not one of them I’d be without. They bring so much to life. 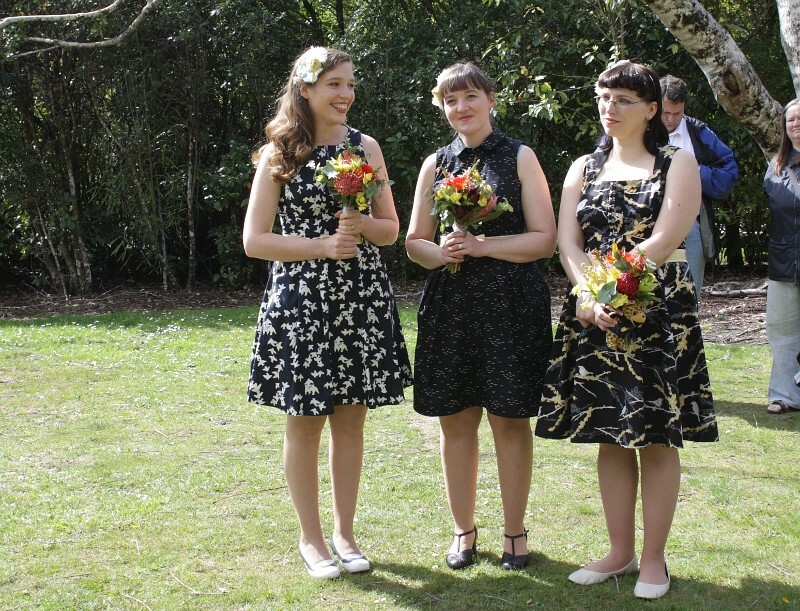 We’ve done photo shoots and costume parties and Sing Star and organised a wedding together. The Dreamstress (and her visiting sister), Shell, Emily, and Sarah at Emily’s awesome retro/steampunk/burlesque/dinosaur themed birthday party. Yes, most awesome theme ever. No idea where I was when this was taken though! Photo courtesy Madame Ornata. 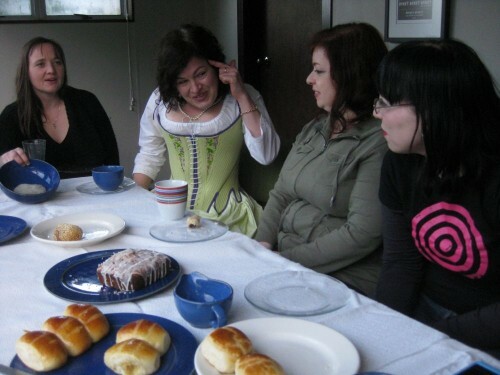 Afternoon tea after a photoshoot modelling corsets for The Dreamstress in Emily’s amazingly decorated home. 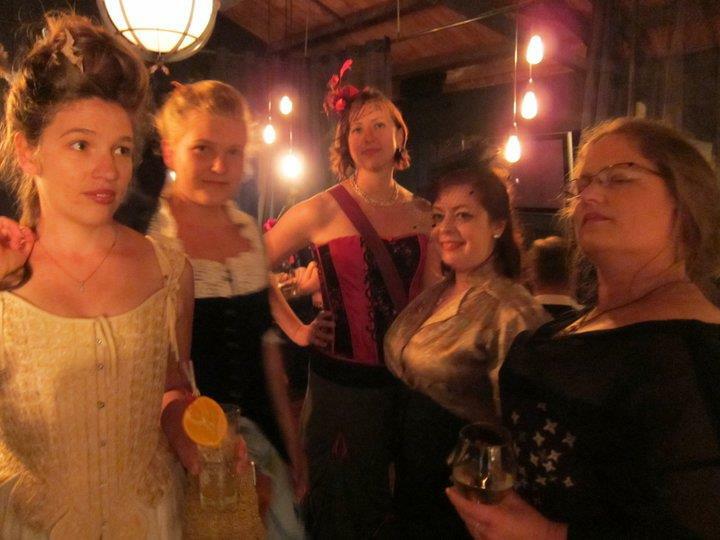 Left to right, The Sewphist, Madame O, Emily, and me. Photo courtesy The Dreamstress. It brings me so much pleasure to have their friendship and I think myself very lucky every time I get to hang out with one of them. And I’m looking forward to hanging out with all of them real soon! One of the few photos of most of us – although still not all! Taken at Shell’s wedding. 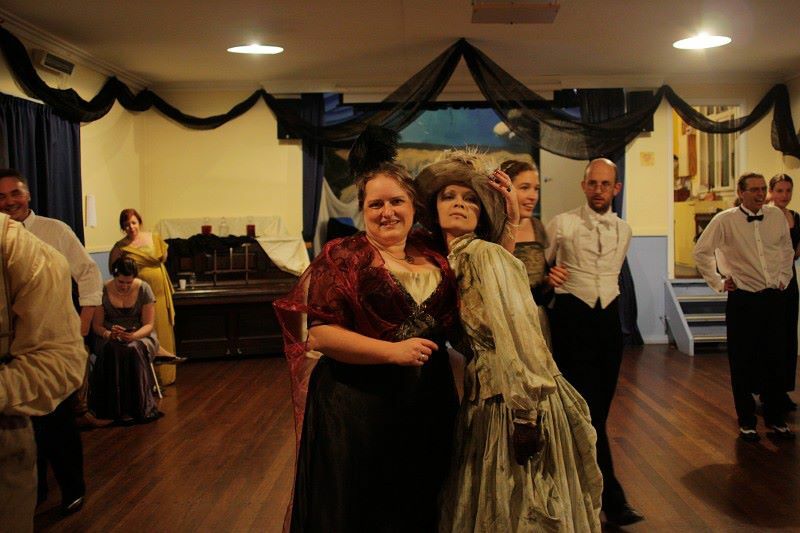 Left to right: Mrs C, The Sewphist, me, Shell, The Dreamstress, Sarah, and Madame Ornata. Emily took the photo! Nini couldn’t make it to the wedding but she made Shell’s necklace and earrings. My wonderful friends, I love you all!